What’s annoying about this message is that sometimes it has nothing to do with permissions at all! Here’s a couple of possible ways to fix it, depending on your system. Note: First, restart your computer in Safe Mode (only XP, Vista, 7, etc.) and see if you can open the file or programs in question. If so, it’s not a “real” permission issue, it’s a program or process on your computer that is giving the error. Firstly, if you’re running into this issue on a Windows Server box running Terminal Services, your problem can be narrowed down to one or two things. The best solution that has worked for most people is to simply uninstall Internet Explorer enhanced security configuration. If that doesn’t work, another thing you can do is to add the server name to the list of Trusted Intranet Sites in IE. Make sure to log off and back on in order for it to take effect. If you’re not running a server, read on. If you are having this issue in Windows XP, Windows Vista, or Windows 7/8/10, then your problem is probably related to an actual permission issue. Norton Internet 200X, Bitdefender, AVG anti-virus, Trend Micro 200X can all cause this problem. If you have any of these programs installed, make sure to disable them and test it you can run programs, open files, etc. If so, then you’ll have to either use a different program or find something on the Internet about to how to configure your software to not interact badly with Windows. The same thing can also happen with an overly aggressive firewall. If you are running Comodo firewall or something similar (other than the basic Windows Firewall), then disable that also. If neither of those two methods worked, the file may be blocked by Windows. Note that this is only for Windows Server 2003 and higher. When you copy an EXE file from another computer to a Windows Server 2003 box, there is what is called a blocked property set on the file. This is due to the increased security on servers. Right-click on the file and choose Properties. You’ll see a button called Unblock at the bottom. Finally, you may actually have a permissions issue. In this case, make sure you are an Administrator or you are part of the Domain Admins group if you are in a domain. Also, you can try right-clicking on the file and choose Run As. Then type in the Administrator credentials and try to run the file. If you are able to run it, that means you account is not setup properly or is not in the right user group. That’s about it! If you still get the “Windows cannot access the specified device path or file”, then post a comment here with details and I’ll try to help! Enjoy! Hi. I am having a bit of trouble with this error. At first I had this error when opening up my verizon security program, after a couple of tries with uninstalling and reinstalling it I realized nothing was improving. I tried installing Avast! Home Edition with no luck. I have Windows XP SP3, all recent updates installed. Any help will be much appreciated. I also found this here which is mentions the same error message but with a different fix: thisishelpful.com/IT_Computers/fix-windows-cannot-access-the-specified-device-path-or-file-error-a6.html. Hope this adds more help to this article. This error had me stumped…in Vista, if opening a cdg file in Media Player using file |open opened it with no problems, but if double clicked on it in an explorer window, it displayed the blasted error. This is a very good article here, summarises the fixes well, but didn't help. In the end, a simple fix worked…right click the file, select open with, select media player…bingo. So, another example of the error having nothing to do with the error message. I experienced the problem in Windows Server. I can run a batch file from the command prompt without any errors. When I try to run the file from the GUI, I get the dreaded "Windows cannot access the specified device, path, or file." error. Running the batch file as an administrator solves the problem. I have the problem in windows XP and I can't find the unblock option when I right click on the file. I tried pretty much all solutions available on the web, but still this problem can't be solved, please help. I'm having this problem with Flight Simulator 2004. I install it and it runs fine the very first time, but as soon as I exit and then try to restart it, it gives me that "cannot access the specified device path or file" error. How can i fix this? How about when Right Click and RUN AS is what's giving the problem ? I can log into the administrator's account from the windows login screen with no problems. However when I'm in as a restricted user ( or even as administrator ) and I try to Right Click and "run as" it allows me to enter the credentials and then gives me this error. It's happened so far on every file I've tried to do a run as on and we have two administrator accounts and neither one's credentials seem to be working. But again , I know the password is correct because I can login to windows with it. great work man……..it worked for me and fixed my problem! Thanks – number 3 was the solution to my problem. What a PITA. Yay! Your ideas worked, you're a genius! I used the unblocking option now I'm able to install *.msi software…. Thank you!!!! NEver would have solved this without this info. I never knew about blocked files on servers. I have tried all 4 items mentioned above and I still can't some of my files to work. I can't even get into add/remove programs without getting the Windows can't access specified device, path or error….Please Help!!!! My problem is the same and I was panicking until i tried another method – so when I double click the icon from the desk top or start menu, it brings up the "windows cannot access" message, but when I right click the icon and select "start" it works perfectly fine. It's just annoying I can't double click, any ideas? In safe mode the file works. But I have windows 7. Please tell what to do to avoid this issue. Had same problem with customer computer. In addition some control panel icons were either missing or would not execute. Everything worked in safe mode. Disabling practically everything with msconfig did not help. It turned out to be anti virus software called AntiVirus5. It is in Program FilesCommon FilesAuthentium. It does not show up in Control Panel -> Add or Remove. I renamed the Authentium folder and re booted. Everything works fine. I had problem when I want to install new program on my computer.Usually I get the error message" Windows cannot access the specified device path or file. You may not have appropriate permissions" when I want to install program from the autorun or setup exe that is inside the cd installer that I want to install on my computer.Please help me asp!! Im running 7 ultimate and having the same problem. I am the admin, the file is not blocked. Its an exe. file. I tried to run it as admin also. Running from the external drive or the desktop did not work.I really need to access this file..HELP ME PLEASE! I found in my case that the problem was I had denied access to 16-bit applications using XP-antiSpy, in response to recent publicity about a security hole. So if the programs you can't run are old, it is worth checking this. It doesn't look as though it would be a solution for many people, but it might help. On windows 7, right click the file, go to properties and under the security tab edit permissions for all the user names. Just give full control to everything/one. Fixed my problem. Just solved this problem by uninstalling the IE Enhanced Security Configuration on a Windows Server 2003. Thanks for the tip. I now guess I could also have solved it by adding the path specified to the list of Trusted Sites within IE, but I am glad that this has worked out. Yet another proof one should not integrate Explorer so tight with Internet Explorer. It's a web browser, not a file browser ! method 2 also works….how about can someone help me when im playing Spore or NFS ..sometimes it crashes it says NFSC.EXE NEEDS TO BE CLOSED. SORRY FOR THE INCONVENIENCE CAN SOMEBODY HELP????? ?JUST ADD ME ON FACEBOOK AND PM ME PLS…..jomel_jim17@yahoo.com. I beleive my case is somewhat different. I re-installed windows xp, the thing is that i dont have permission to do almost nothong. I can open folders, but cant run .exe. I cant go to control panel and enter: users, network, hardware, i cant uninistall nor change anything. I always get the message “windows cannot acces the specified file, path,etc. You may not have access permision.” I have checked that i am the administatror, but dont know what to do… please help. The third step worked for me! THANK YOU!!! Great post, you really came to the rescue for me today. Thanks for posting it! Hey everyone. I think I found the solution, but, you have to do it manually. 1. First, right click on the program that you want to run. 2. Choose the Properties option. 3. Then, tab to "security." 8. Scroll the list until you find "User" and double click on it. Now, you can install that file. Hey, all. The same problem just happened here. I found that error after creating a new user with limited access to my computer. My problem started after I upgraded my Kaspersky Internet Security 2009 to 2010 on a Windows 7 laptop. There is an application control section, in Kaspersky that was set to "deny." I changed it to "prompt for action." Didn't have to turn off the firewall. That message would not let me open ANYTHING..not even a folder. I went in safe mode and uninstalled Zone Alarm and maybe 2 other programs I don't use, and it seems to be working fine now. Im Running windows xp , & renaming the folder Authentium works for me. thanks. LizLock, you are awesome! I have been trying to figure this out for months, then finally decided to reformat. I installed Comodo with the highest security levels, because I thought something had slipped through. This made things worse, and when I tried to install VLC media player, I got the same window when you select "run as". I don't use an administrative password, but nothing I did would allow me to install VLC. I finally grew tired of Comodo's crazy convoluted menu system, and decided to reformat AGAIN with another firewall. After hours of work, one of the last programs I tried to install was an old American Heritage Dictionary program that had suddenly stopped working months ago. Nothing worked, even in safe mode. I saw the post above about XP-AntiSpy, and that's exactly what it was!! Thank you so much! Special thanks also to Aseem. Even though your tips didn't apply to me, this is the best guide to solving this problem by far! One more item to check for Windows 7 users. Check and make sure the file isn't being run from the Documents library folder. If it is, move it to a more suitable location such as C:downloads and it may run fine from there. I am having the same problem on Windows Server 2003 and the method -3 worked for me. Thanks for the help. Similar problem here, but completely random. I can click on the same shortcut 10 times in a row, and it will work fine 8 times–giving the error the other 2 times. I am logged on as an administrator, and have full permissions. I don't get it. Intermittent permissions errors just don't make sense. I am having this problem, i downloaded Gimp from Cnet, and when it doesn't say this, it doesn't know what file to use to open it, or it says i have to reinstall the software. I had the same problem with an application I tried to open but I got it fixed now. I ran Windows XP and AVG. AVG was the one blocking it since it thought it's a malware/virus/worm/whatever. lol xD I found that ignoring it when the warning pop ups still did not grant me access to the app. I almost considered uninstalling the whole AVG anti-virus but I tried disabling the Resident Shield first and it worked. To those who have the same prob & doesn't want to uninstall AVG, try opening AVG User Interface, go to Tools -> Advanced Settings -> Resident Shield -> Uncheck Enable Resident Shield and Apply. Thank you. The unblock action on the properties tab did it for me. I am having the same problem on Windows XP and the method 2 worked for me. Thanks for the help. I uninstalled IE security, added the servers to the local trust in IE, and checked the "block-exe'' thing, but I still cannot open anything. Creating a new user solves the problem (onto the w2k3 box), but, unfortunately, this is not an option for me. I checked security and the user has full control in the folders etc. In Windows 7 Home Premium, I got this message. I went into Safe Mode and I set the password for the user. After a reboot, everything is working properly. Under Windows 7, disable any antivirus application and re-try. It was AVG that was the problem on my machine but the error message gave no hint of that. I get this error while trying to install Windows XP on my computer. I click OK and it finishes installing, but when it is all done, I can't open anything on the computer. Stupid antivirus. I have sophos installed and that was causing the issue. I stopped all the services and I was able to run all the programs that were blocked. I cant turn off or turn on my firewall because of this error. I am running WIN XP Pro with SP3. There are no AVG programs running or installed. NO SERVER. This just recently started happening. I am running AVAST and Microsoft Security Essentials. Thanks for Method 1. Windows Server 2003 Terminal Services solve my problem. Thanks. I have admin access! The only icon that does work is Internet Explorer, but that doesn't load the homepage, just reloads every second to a never ending cycle of a blank page because it won't stop refreshing it! I put AVG , Panda Security and SuperAntiSpyware on a flash drive and tried to install the 3 of them to run on the laptop to see what's up, but I get the same "Windows cannot access…." error message…. I can watch videos with VLC player from the files on my external, but that's about it. What is going on? What commands or code can I enter on start screen to restore my laptop? I can click control panel, but I can't go to user accounts to add a new admin user so that I can delete this current admin user. I get the same "Windows cannot access….." message! I don't have a solution, but a very reliable workaround. I find that it works for me when the program is launched from the command prompt. 1. Press Windows-R. Type cmd. 2. In Windows XP, drag the program .EXE to the command prompt window and press Enter in the command prompt. In Vista and higher, you need to shift-right-click the .EXE file and select "Copy as path." 3. Right-click in the command prompt window and select Paste. I was having the same problem on an HP Pavilion dv7 laptop with Windows Vista Home Premium and non of these worked for me. What did work was to create a new account with administrator privileges and delete the old one. You will need to move all the files and backup the email to the new account before deleting the old one, but this fixed the many problems I was having on the computer. I tried to save the old account by changing from admin to user then changing back to admin but that did not work either so I just deleted it. Hope this helps someone else. Saw a lot of posts on this and this was not a solution anyone suggested, just something I tried. I read thru some of the posts above, but didn't read them all. My solution to this problem was that Online Armor Firewall was blocking it, yet I didn't know it. After thinking it was a User Account issue, then an AVG Firewall issue, to no avail, I opened the interface to Online Armor and there it was telling me it had blocked me from opening the EXE file I was having the popup message with. I right clicked it and it gave me the option to allow it to run. Methods 1-2 did not resolve the issue, however Method 3 DID. For some reason the file was "blocked" and unblocking it allowed me to install the application. Method 3 worked for me, too. Thank you! Thanks! I've had this issue on a laptop running Vista, for a while. I finally got tired of using a batch-file-from-the-command-prompt work-around and came across your article, which led me to the solution – Disable Access Protection on McAfee VirusScan Enterprise. Thank you very much, mimimi, it worked for me. But, I have one question: Disabling the Resident Shield will not effect the AVG functions? After reading and trying all these, I still can't access my photos. They are colored green (their titles). My problem is it won't even open my desktop. It did the first 2-3 days, but now it just doesn't open and I can't seem to open it in safe mode. I press F8, but it doesn't seem to work. I used method 4 and it turns out it is a real permission issue for me. How do I fix this? I can right click and run as admin, but is there a way to fix it? Kaspersky Internet Security was the culprit in my case. I shut down the firewall and the problem went away. In 'threats and exclusions,' I added the problem 'exe' file as trusted and everything is back to normal. Access Group Policy (Start -> Run -> type "gpedit.msc"), go to Administrative TemplatesWindows ComponentsApplication CompatibilityPrevent access to 16-bit applications and set it to "disable." You have to do this even if the default is set to "Not configured." On my PC it was set to "not configured" and, despite that, it was not permitting me to execute old 16-bit apps. None of this worked. I'm trying to install Open Office and I got that error. I am the administrator. It's on my C drive not on a server. I unblocked it. I took ownership. I turned off my anti-virus and my firewall. There must be one last thing I'm missing. Thanks for this. This is so very helpful. Alternatively, if you have AVG, you can disable protection for a specific path by navigating to Tools -> Advanced Settings -> Exceptions (Under Resident Shield) and adding the desired path/lists there. After trying the second method, it works! I've got this AVG thing. Then, after I disabled the resident shield, the error message doesn't appear any more. I used number 3: I didn't know that. Basically, I've tried everything here and even the suggestions themselves give me the error message. Is there any other way, or can someone tell me what's wrong? I tried all the above methods, but failed to try and install a .exe file. I keep getting the error. I have Windows XP SP3. What a HEADACHE!!! This is my story: I just got my new laptop. It came with windows 7 (64-bit) installed. So, I had to install all the programs on it. Everything was going great until I started to get that annoying message. First, I tried playing with the security settings, and change accessibility from advanced settings, and even tried the unblocked security from file property as someone suggested. NOTHING. Same error. My problem was caused by a corrupted anti-virus software I had previously installed. My solution: Uninstall that piece of junk. Now, this computer is working like a dream. If you experience this problem when you try to run a program with different privileges (Run as…), make sure you have set service 'Secondary Logon' to 'Automatic'. Doesn't work for me. I got one virus scanner AVG. I'm trying to open ElderEdit at the file path: "C:Documents and SettingsLoungeDesktopOblivion mod savegameElderEdit." It gives exactly the error mentioned in this topic. I have also tried the run as administrator but it says I can't have a blank password. I know for sure that I am an administrator as only user on the computer. I'm running on Windows XP and I don't have anything like Windows Server 2003 or Internet Explorer enhanced security configuration in my list of software. Same problem here…some files…programs give me this warning.. I created a new user and copied all the documents and settings to this new user…. So for the time being till I find a better solution, I work with 2 users in parallel! Thanks buddy, it worked like a CHARM. Appreciate it. 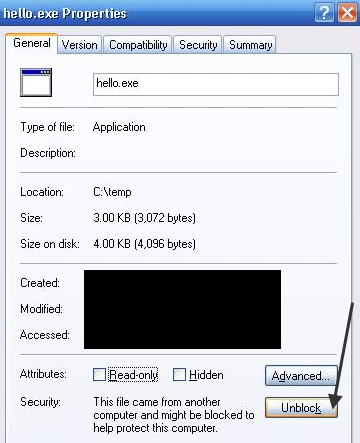 I found this behavior on the account used by the wife and kids who are not as savvy about avoiding deceptive pop-ups that trick you to install malicious code. MBAM was the solution. Interfering with links from the start menu seems like a good defense strategy for malware to block antivirus programs or anything that's not a browser. Another trick they do is "disable taskmgr", this makes it hard for you to stop their shenanigans. Thank-you so much for this. Many methods and the last one fixed it for me. Thanks so much – your thread is greatly appreciated. Really? Unblock? Where the heck did that come from? I could see my whole day going up in smoke as I played with permissions which is 99% of the problem anytime something does not work on Windows. Thanks for the unblock answer. Check the spelling of the name. Otherwise, there might be a problem with your network. To try to identify and resolve network problems click Diagnose"
If i ping the computers from the server it works but if i ping from the clients it fails. It also happens when i try to see the files from the clients on the server it will fail. This problem started when I was trying to access a web site. Suddenly, this website closed on me taking with it, several other websites that I had open in their tabs. And then, Webroot anti-virus security popped up asking me if I want to block a particular .exe program or not. Fearing it was a virus since my internet browser closed automatically on me, I clicked Block. By doing that, I have pretty much disabled my computer. A little bit after that, this pop-up ad thing showed up featuring something called antivirus2004 or someting like that. It started to do some kind of animation as if it was checking through your computer for viruses. So, fearing that was some kind of spyware or malware, as i’ve seen it before, I force closed the program. I want to go into safe mode and do a system restore so badly, but at the same time, I fear that there could be a virus causing a part of this problem. I will eventually do a system restore as that has helped several people in the past. I’ll give other suggestions a shot as well. I wonder if the program I blocked has anything to do with the 16 bit program thing? I should’ve jogged down the name of it so I could find it in my computer to unblock it. This just popped up yesterday. I'm using portable apps on my flash drive and now when I try to run them from my flash drive it comes up with that error. The thing that doesn't make sense is that it worked fine yesterday. Must be one of M$ updates. Whoever wrote this article, I love you. Problem solved by simple unblock! Thank you! Had this issue on one W7 PC which was set up same as another that was working ok. In my instance I wanted to access a specific directory to share (on a server). Turned out that adding NETWORK in security for the folder (on server) let it through. The folder was set up as a work computer and the others wanting access were set as home so I expected some problem but not for the two homegroup ones to act so differenty – they even showed identical maps and net settings – anyhoo hope this helps someone. if we will uninstall avg antivirus then it will work or not? TY! I've been messing with this for over an hour and a half. I had my programs blocked. That simple. And I'd been trying to check file paths and other things with no luck. adding the server to intranet site, fixed ths issue. In my case it was Kaspersky Antivirus on win7 x64, When I've disabled protection, I could execute exe file. do a 'System Restore" and everything will be OK again. This was my problem before and 'system restore' fixed it. I had this problem on Windows 2003 server. I noticed that the internet explorer enhaced security configuration has been installed on this server. I simply unblocked the file and installed it. Okay, so I've determined it's my AVG-antivirus that's blocking my programs (even itself, ridiculously, because I had to select run as admin to open it). Will a reinstall of AVG fix this, or do I need a new antivirus program? Windows 2003 Citrix server was giving the error but only on .bat files and only in certain folders on shared network drives??? 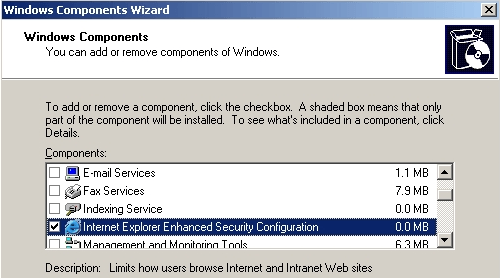 The IE Enhanced Security Configuration fix worked perfect for me. Thanks! Did u ever figure out how to fix ur computer? Mine is doing the exact same thing and it was fine yesterday. Thanks method 3 worked for me. This was very helpful since I had never run into this before. from my windows 7 desktop, i have mapped d as a network drive and it show up in the explorer . however when i try to access it i under the network\PWDNOHAR-pc\d, i get “windows cannot access \\PWDNOHAR-pc\d” you do have permission to access \\tareddy-pc\desktop d. contact your network administrator to request access. omg omg omg, its been over a YEAR since i was able to use some of my programs. it was selectively refusing access to programs and adding programs one by one. i.e not all 16 bits were refused. But your fix worked. Mine was set at “enable” chged to “disable” TU SOOOOOOOO much. I am using Win 7 Ultimate. I have stored a collection of software on a local disk (f) of my hard disk drive. The software in that drive is not working, but the software on the other three drives are working properly. That is, when double clicking the setup file, it shows “Windows cannot access the specified device, path or file. You may not have the appropriate permissions to access the item”. What should I do to resolve the problem?? ?